Installing a basement floor drain is a good idea for many reasons. During the construction phase having one or two basement drains will give rain water a place to go until the roof is shingled. Not installing a floor drain in the basement means you will have a wet basement floor for days after it rains, making it impossible to store anything until the roof is water tight. Find out where to buy a floor drain at the bottom of the page. If you want to know how to install a basement drain system, it's really quite easy with a little pre-planning. For new construction it requires the foundation contractor to leave a hole in the footing to run the drainage pipe through. The excavator will have to dig a drainage trench leading away from the foundation, so you can lay the drain pipe into, giving the water a place to exit. The two types of concrete floor drainage pipes you can use are the 6 inch black flexible drainage pipe that comes in a 50 foot roll or the 4 inch white perforated pipes that come in 10 foot lengths. After the concrete footings are in place, you lay the basement floor drainage pipe along the inside of the footing and out through the hole in the footing. Drainage pipe should also be installed along the outside of the footing and tied together with the inside drainage using the proper fittings. Both inside and outside drainage pipes are then connected to the pipe in the exit trench giving you a complete basement drain system for keeping your basement floor dry. Wherever you decide to have a floor drain in the basement, saw a small piece out of the drain pipe and install a "T" adapter so you can have a short piece of pipe sticking straight up. This will be cut down to grade later and the cellar floor drain will be glued to the top. It's best to back-fill the drainage pipes with crushed rock, completely surrounding the pipes to keep any sand or gravel from entering the pipes and eventually clogging them. 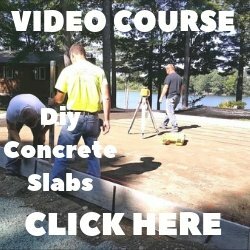 Working with your excavator or having them install the concrete floor drains and pipes will make this process very easy and well worth it. 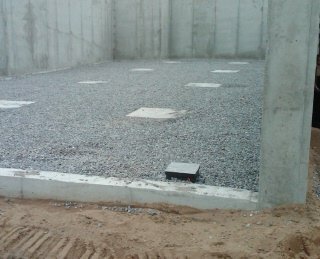 After all the drainage pipes are installed and the crushed rock is in place, the remainder of the interior floor can be graded with crushed rock or gravel. It's a good idea to let the concrete floor contractor set the cellar floor drain to grade. This will insure the basement drain has the correct pitch. If you are going to invest the time and money it takes to install a basement drain system, you want to make sure any water that gets onto the basement floor runs into the basement drain. This is a 6 inch floor drain we install in our concrete floors when the customer wants a drain in their basement. You can use it on a 2, 3, or 4 inch drain pipe. We'll set it on the pipe at the correct height and glue it in place. 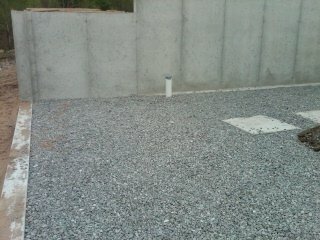 This is a 9 inch floor drain we use when we pour concrete floors for a garage. I like a little bigger drain for garages. There's usually more water on the surface of a garage floor and this drain works very good draining water fast. Here's some other interesting topics about basement floors. you have a really wet basement with standing water and puddles click on BASEMENT_FLOOR WATERPROOFING to learn how to fix having a wet basement. If your basement concrete floor is just damp or moist click on WATERPROOFING BASEMENT_FLOORS to learn how to have a dry basement. To learn how to install insulation on top of your basement concrete floor click on BASEMENT_FLOOR INSULATION. 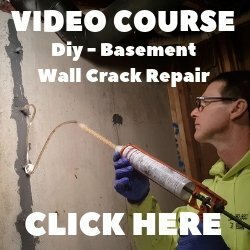 Click on BASEMENT_FLOOR CRACKS to learn how to repair cracks in your cellar floor. Click on BASEMENT_FLOOR SEALER for tips on what to use to seal your basement concrete floor.